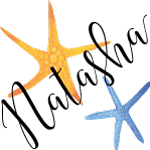 Maybe it’s because I live near the beach, but summer seems to demand some breezy, boho DIYs! The funky, casual vibe feels perfect for lazy summer days. Dreamcatchers and wall hangings seem to be all the rage right now (or maybe that’s just my Pinterest feed? ), so for this boho summer crafts roundup I tried to find some less common boho-style crafts to share. I really hope you enjoy this combination of colorful, breezy, and whimsical boho summer crafts! What could be more summery than a pair of barefoot sandals? This tutorial on how to make your own Barefoot Beach Sandals from Something Turquoise will have you ready to hit the sand in boho style. 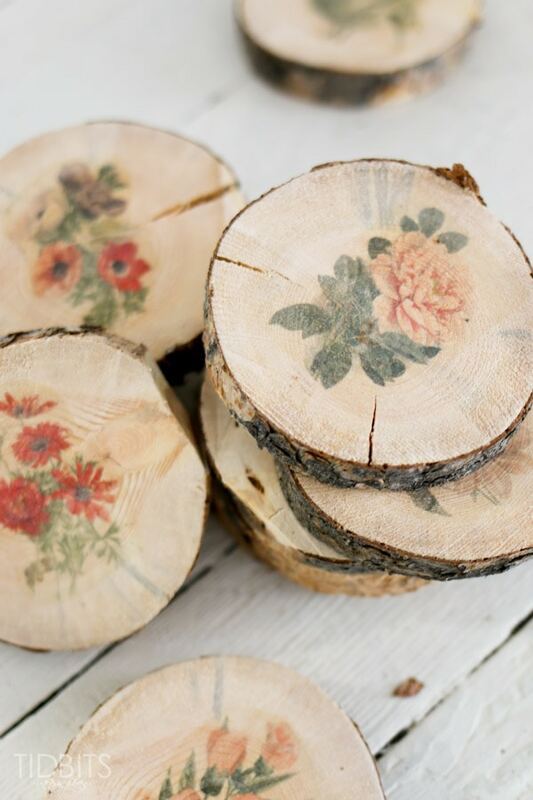 These sweet Botanical Wood Slices from Ella Claire are the perfect way to bring a boho-hippy style into your home! There are so many boho earring options on the web, but I really like how this DIY Boho Earrings tutorial from Crafty Little Gnome demonstrates an easy wire wrapping technique to hold the beads in place. 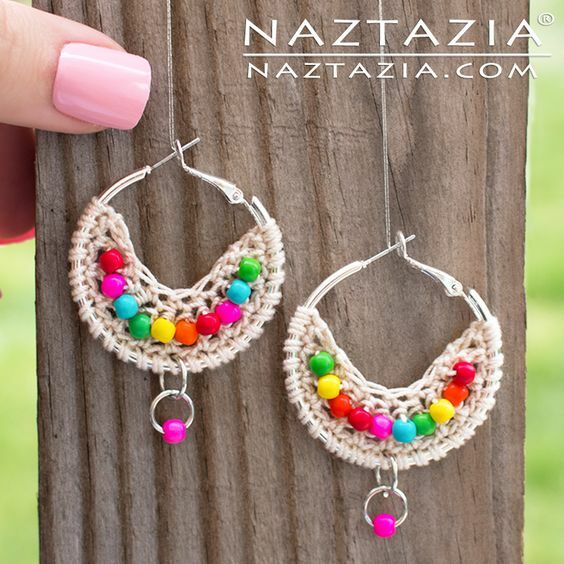 If you’re looking for a more challenging project, these Crochet Bead Boho Earrings from Naztazia are for you! The tutorial is a video, which is pretty helpful for a crochet project! I really want to find some rainbow beads to make my own. Because of wind chimes my grandmother hung on the font and side porches and the house in WV, I always associate wind chimes with summer. These DIY bamboo wind chimes from Free People are a decidedly boho way to bring wind chimes into your summer! To honest, gladiator sandals are not my style. I’m short and I have a long torso in comparison to my overall height, so I personally try to avoid shoes with straps around my ankles because I believe them make me appear even shorter! (I actually like my height and generally avoid shoes that make me seem shorter or taller. I think the last time I wore heels was our wedding and they were only 1″!). Anyway, in spite of not wearing them, myself, I totally admire people who can pull off the gladiator sandal look. 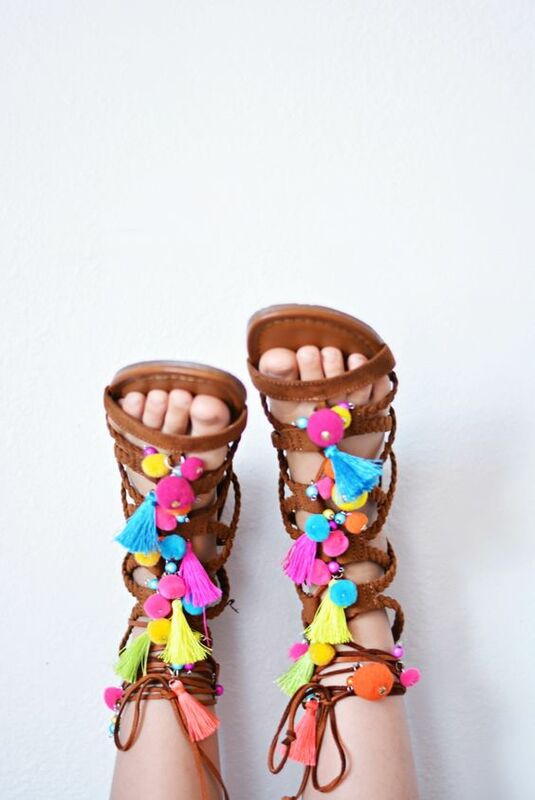 If you’re one of those folks, then you may enjoy these DIY Pom Pom Tassel Sandals from Little Inspiration! 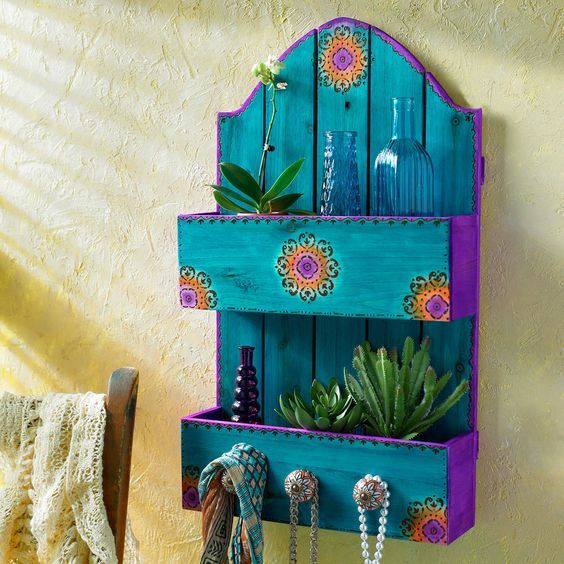 This boho shelf from the Michael’s craft store site is awesome! Even if you don’t follow the exact tutorial, the techniques and materials would be lovely for other wood projects, too. 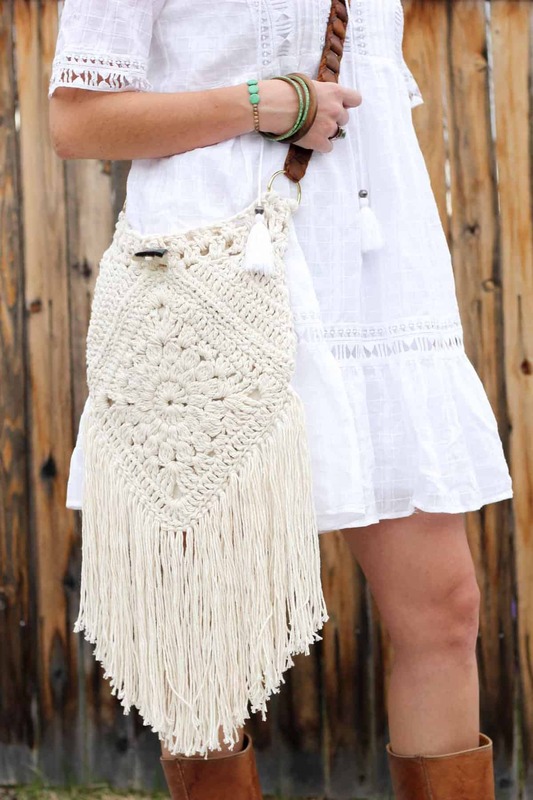 It wouldn’t be a boho summer crafts roundup without a crocheted bag! This Urban Gypsy Boho Bag from Make & Do Crew has so many lovely shapes and textures. This Woven Necklace DIY from A Beautiful Mess combines weaving, stones, and a piece of copper pipe! How much fun is that? 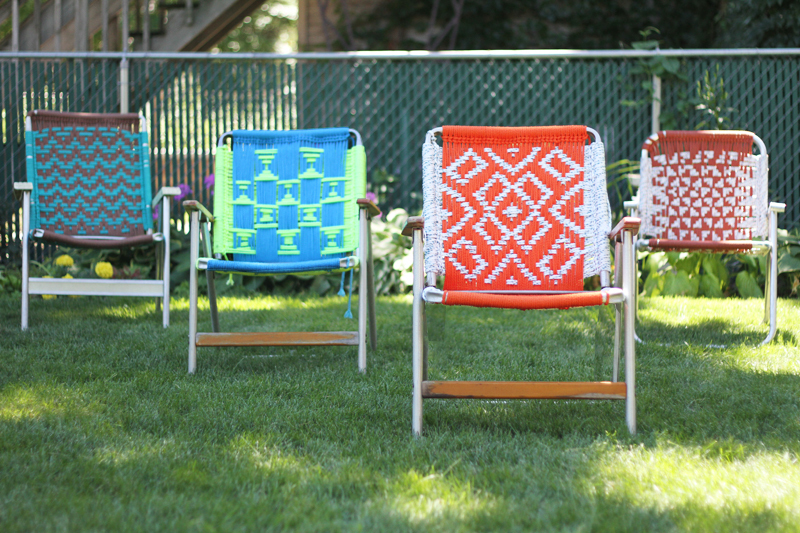 I always associate macrame with a boho style, but instead of a macrame wall hanging or flower pot holder I thought it would be fun to share this awesome Macrame Lawn Chair tutorial from Henhouse. Aren’t they cool?! Ironically for someone posting about summer and the beach, we’re about to head away from the beach for a month! By this time next week we should be in West Virginia taking plywood off windows and seeing how many mice moved in over the winter. I’ll give this reminder again, but The Artisan Life will be up and running while we’re gone! 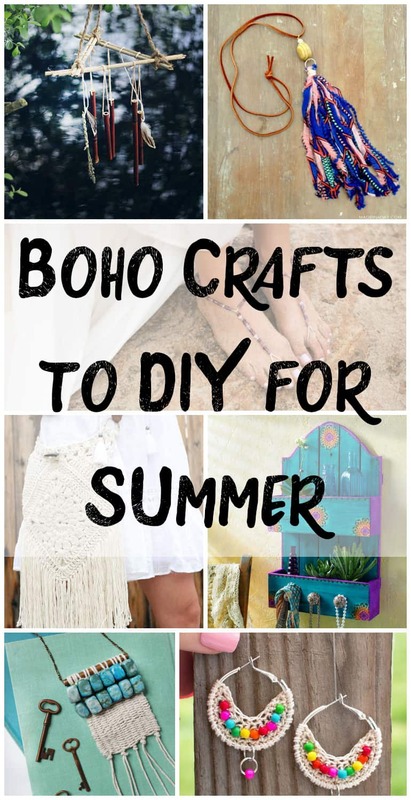 Whether you make any boho crafts for summer or not, I hope you find some laid-back crafts to celebrate long, summer days and enjoy some relaxation! Thank you for including my wire wrap earrings! I love summer crafts! The fabric tassel necklace is a great way to use up scraps! Those chairs are cool! Macramee was one of the main trends at this years trade show! Yes, I really want to make a few fabric tassels now! It’s such a perfect project for those little scraps you just can’t part with. Neat that macramé was a big trend! I may have to re-learn some of the knots I forgot.